As a new developer, you should be a just in time learner. Just like the compiler watches to see what is used often and then optimizes the code that runs fast and often, you should do the same. That’s why I recommended you learn version control and a text editor. These are tools that, as a software developer, you spend a lot of time in. So learning them well will save you time in the long run. But what about the intricacies of a language or framework. That’s important too. But it depends on how often you predict the issue will come up. 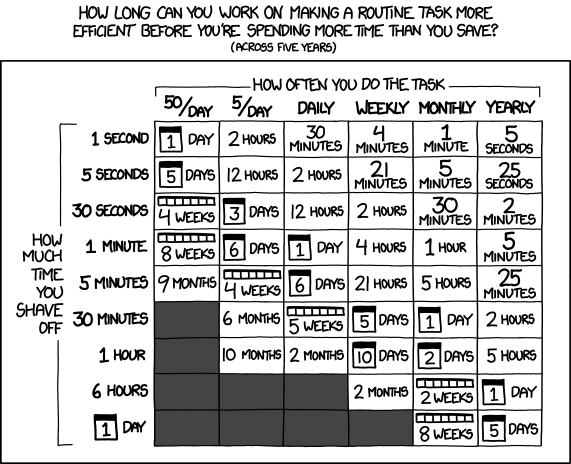 Here’s a great chart from XKCD. If you spend two hours remembering how to do something but you only do it yearly, and you learn it well enough to do it in one hour, you save five hours over five years. Does this make a lot of sense? When you learn SQL you learn a way to query across multiple different databases. When you learn vi keystrokes, you can use them to edit a text file in a terminal on any unix machine, on the command line to navigate your history and directory structures, and in eclipse or visual studio.